Christmas is celebrated differently all around the world. 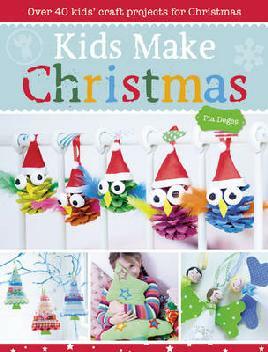 Many children in the Northern Hemisphere have a cold Christmas, snuggled inside with roaring fires and snow outside. Children in the Southern Hemisphere have a very different, very warm Christmas — often with BBQs! These books show the different ways children all over the world celebrate this special day of peace and goodwill. A Pacific version of the popular Christmas song The Twelve Days of Christmas, with such gifts as four rolls of tapa, three frangipanis, two cans of corned beef and a manulele in a mango tree. A retelling of the Christmas story with a New Zealand twist. Farmyard animals including a cow, sheep and kune kune come with gifts such as a rugby ball, pavlova and jandals for the baby Jesus by the cowshed door. Illustrated by Gavin Bishop. We wish you a Kiwi Christmas, a sweet-as Kiwi Christmas, a cracker Kiwi Christmas and a kapai New Year! Little Kiwi dreams of riding through the skies with Santa, and is surprised one Christmas Eve to come across Santa with a broken-down sleigh. With the help of some of her bird friends, Little Kiwi finally gets her wish! 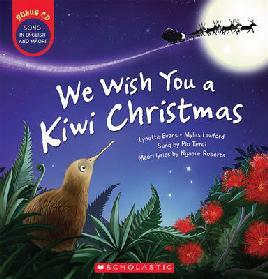 Includes CD in English and Māori. A Christmas countdown which makes teaching and learning Te Reo Māori fun and easy. Join a Kiwi family on a countdown to Christmas at the beach. Includes compact disc. 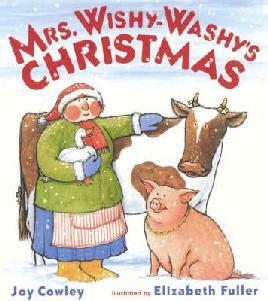 Mrs Wishy-Washy has told her animals they must have a good scrub in the bath or they won’t get their Christmas presents, but it’s so cold in the old barn. Duck knows where there is a much better bath, with warm water and bubbles. The family have dressed the Christmas tree and it is looking perfect. Then Slinky Malinki arrives and enjoys himself playing with all the decorations. A comic about a grumpy Father Christmas who loves nothing more than a cup of tea and for Christmas Eve to be over. 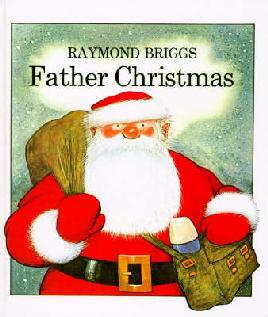 Also look at the sequel, Father Christmas goes on holiday. A Christmas Carol is a classic morality tale about Ebenezer Scrooge, an old penny-pinching man who is visited by four ghosts on Christmas Eve. Frightened by the visions they show him, he emerges on Christmas morning with a warm heart and good tidings for all. A collection of Michael Morpurgo’s amazing Christmas stories, including The best of times, On angel wings, The best Christmas present in the world and a new story The goose is getting fat. Horrid Henry has a brilliant idea for his family’s Christmas presents. Who says he has to BUY them at all? 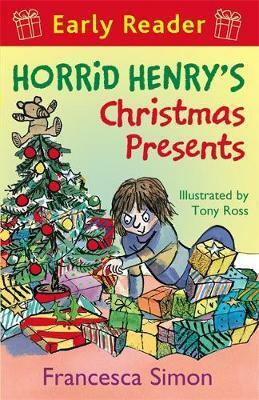 Also check out, Horrid Henry’s Christmas play. Great books for early readers. On Geronimo’s trip to meet his family in New York City for the holidays, his luggage gets swapped with another mouse’s! Now he has to scurry all over the Big Apple trying to track it down. A magical train ride on Christmas Eve takes a boy to the North Pole to receive a special gift from Santa Claus.